Women with gynaecological malignancies are at high risk of developing ovarian cancer (OC). OC does not show any symptoms in the early stages, resulting in a delay in detection and definite diagnosis is obtained in the later stages. At present, ultrasonic imaging and assay of biomarkers (e.g. Human epididymis protein 4, HE4 ) are used for the diagnosis of OC. But the ultrasonic imaging can not discriminate between benign and malignant tumours and the immunoassays are time consuming, require sophisticated equipment and skilled professionals. Therefore, there is an urgent need for the development of a sensitive method for trace assay of biomarkers such as HE4. 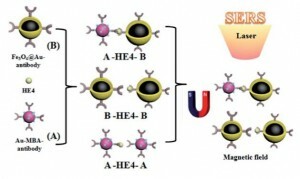 Jianlin Yao and colleagues from the Soochow University have developed a new approach based on surface enhanced Raman spectroscopy (SERS) and a magnetic immunoassay technique for rapid detection and separation of HE4 with high sensitivity and selectivity. ‘ The immuno nanoparticles studied could be developed as reagent kits in the clinical diagnosis of cancer’, opines Jianlin Yao. To learn more about the study, read the full article for free* by following the link given below. Take a look at our new hot articles just published in Analytical Methods. These papers are all free to read for the next few weeks. We hope you enjoy reading them! Leave a comment to share your thoughts with us! Take a look at our new hot articles just published in Analytical Methods. These papers are all free to read for the next few weeks. Enjoy the reading!